The AWS Deep Learning AMIs (DLAMI) for Ubuntu and Amazon Linux are now pre-installed and fully configured with Open Neural Network Exchange (ONNX), enabling model portability across deep learning frameworks. In this blog post we’ll introduce ONNX, and demonstrate how ONNX can be used on the DLAMI to port models across frameworks. ONNX is an open source library and serialization format to encode and decode deep learning models. ONNX defines the format for the neural network computational graph and an extensive list of operators used in neural network architectures. ONNX is already supported by popular deep learning frameworks such as Apache MXNet, PyTorch, Chainer, Cognitive Toolkit, TensorRT, and others. The growing support for ONNX across popular tools enables machine learning developers to move their models across tools, picking and choosing the right tool for the task at hand. Let’s go over the steps to export a Chainer model to an ONNX file. We’ll start by launching an instance of the DLAMI, on either Ubuntu or Amazon Linux. If you have not done this before, review this great tutorial showing how to get started with the DLAMI. Once we are connected to DLAMI over SSH, let’s activate the Chainer Python 3.6 Conda environment, which is pre-installed and configured on the DLAMI. Note that this environment is now also pre-installed and configured with ONNX and onnx-chainer, an add-on package that adds ONNX support for Chainer. Next, start a Python shell, and run the following commands to load a VGG-16 convolutional neural network for object recognition, and export the neural network into an ONNX file. With just a few lines of code, you now have exported the Chainer model into the ONNX format and have stored the file in the current directory. Now that we have exported our Chainer model into ONNX, let’s see how we can import this model into MXNet, and run inference. We’ll start by activating the DLAMI’s MXNet Python 3.6 Conda environment, which comes installed with ONNX and MXNet 1.2.1. MXNet 1.2 introduced the ONNX import API that we will use to import the ONNX model into MXNet. That’s it! You have just loaded the ONNX model into MXNet, and have the symbolic graph and params available. Let’s continue to run inference with our newly loaded model. The output shows the model prediction. 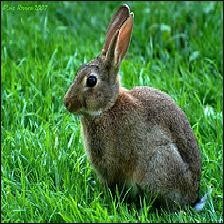 The model predicts the image to be a hare with 97.9% probability! In this blog post you learned how you can use ONNX on the DLAMI to port models across frameworks. With the portability enabled by ONNX, you can pick and choose the right tool for the task at hand, be it training a new model, fine tuning a pre-trained model, executing inference or model serving. You can get started quickly with the AWS Deep Learning AMIs by using our getting started tutorial. Check out the DLAMI ONNX tutorials, as well as our developer guide for more tutorials, resources, and release notes. The latest AMIs are now available on the AWS Marketplace. You can also subscribe to our discussion forum to get new launch announcements and post your questions. Anirudh Acharya is a Software Development Engineer for AWS Deep Learning. He works on building deep learning systems and toolkits to democratize AI. In his spare time he enjoys reading and biking. Hagay Lupesko is an Engineering Leader for AWS Deep Learning. He focuses on building deep learning systems that enable developers and scientists to build intelligent applications. In his spare time, he enjoys reading, hiking, and spending time with his family.